Audio Editing has always been something which have two schools of thought in our business. Either you are a “player” in that space and you aren’t in the playback end of the business, or you are in the play out business and have something which is very utilitarian which helps your clients do their job in the absence of anything else. Typically in the latter case, your features certainly don’t rival anything the “players” have. In Master Control, we had a nice single track editor, capable of some slightly advanced features. NexGen “borrowed” Audio Wizard’s editors, which were updated to run on the newer operating systems, but very few features added to it. 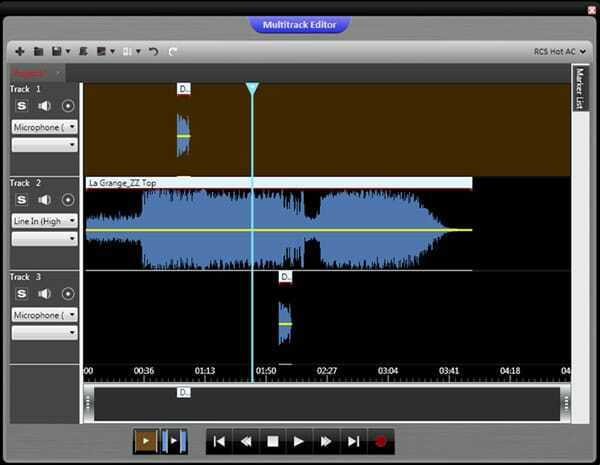 The “Mini Editor” which is used for quick recording, and simple cut edits. And the “Wizard Editor” which was a very vbasic Multi Track recorder, but mix down was always read time. Enter Zetta. To get us started, we “borrowed” Master Control’s single track editor, with an updated user interface, and a few new bells and whistles. But, what we found was that Master Control’s audio foundation was a bit limiting, and we still needed a true Multi Track experience in the product anyway. Last year, I challenged my team to solve this problem for the company once and for all. We worked on what the specification were, and we built a new editor from scratch instead of using the audio foundation of Master Control. The amazing result can be seen in Zetta version 3. First of all, compared to NexGen’s editor, mix downs are happening faster than real time with a real rendering engine. In addition, audio imported to tracks in the MTE (Multi Track Editor) are left in their native format so the user down not have to wait for them to be converted as even some of the pro products are want to do. This means a very responsive system, made for the busy on air environment. Finally, the MTE is embedded into Zetta. This means that it is a part of the fabric of the product now. It absolutely is a much better experience than something which is launched with a command line pointing to a file which you will find in other products. Being a part of Zetta, we can drag and drop any audio asset in the database directly to a track in the MTE. Audio can be mixed down and that mix down can be dragged to a Hotkey, or to the log, to an asset, or anywhere in the application.